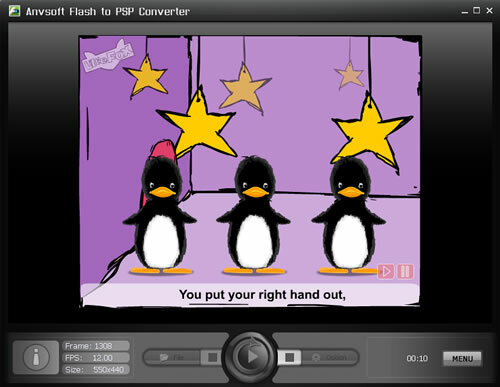 ANVSOFT Flash to PSP Converter is a powerful utility that convert Macromedia Flash SWF files to MPEG-4 files including movie clips, action scripts and audio in the Flash movies. It is designed to convert Flash SWF to MPEG-4 format playable on Sony PSP. With Flash to PSP Converter, you can easily turn your Flash videos into memorable projects on your mobile devices such as Sony PSP and Pocket PCs to share with family and friends. ...... Converting your Flash files to PSP playable MPEG4 files is just a breeze! This really comes in handy and saves a lot of time when you want to create something truly unique from your SWF Flash resources. Convert Flash SWF files to MPEG-4 movie playable on iPod. Qweas is providing links to Flash to PSP Converter 2.12 as a courtesy, and makes no representations regarding Flash to PSP Converter or any other applications or any information related thereto. Any questions, complaints or claims regarding this application Flash to PSP Converter 2.12 must be directed to the appropriate software vendor. You may click the publisher link of Flash to PSP Converter on the top of this page to get more details about the vendor.